Islanders are here again! Become the part of the new adventures! After all the misfortunes the islanders are finally happy. After returning to their home island they saved the Chief's stolen bride and celebrated the wedding. They even made friends with the evil shaman. It turned out that the shaman was in fact a pirate who was cursed after finding a shaman's mask. The desperate pirate told the story of his miseries and asked the islanders for help. Of course they couldn't let the new friend down and set out on a mission to save him. Follow them in the fascinating journey through time and make new friends. Find the altar that can help the pirate get rid of the curse! 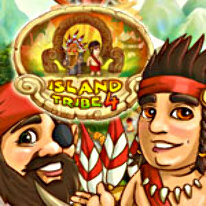 Travel through time with the brave islanders! Help the residents of Ancient Egypt, Scandinavia and China!